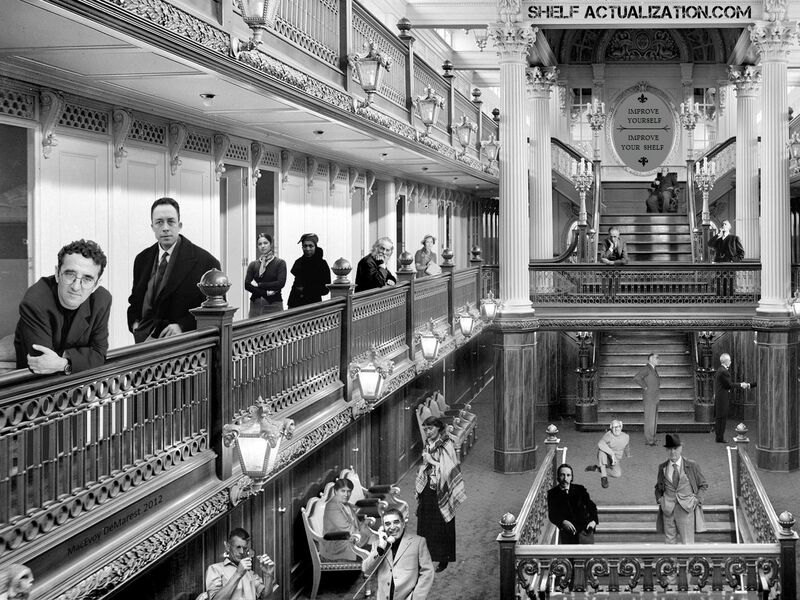 On the mezzanine level to our left we see Roberto Bolaño hunched over the railing next to Albert Camus. 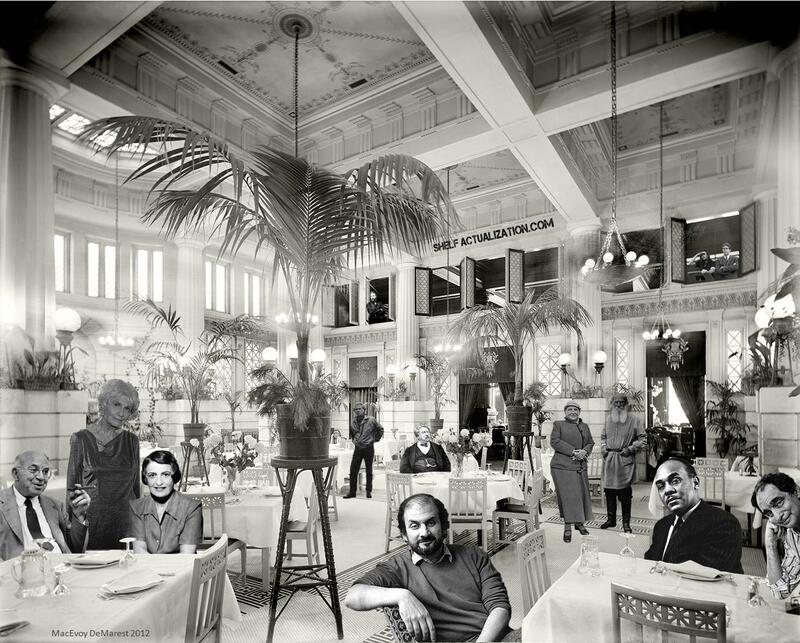 Jhumpa Lahiri and Zora Neale Hurston stroll down the hall, while Walt Whitman, Margaret Mitchell, Sinclair Lewis and Hermann Hesse take in a view of the lobby below. Ensconced in the easy chair on the landing above, Henry James watches over all. At the foot of the stairs Thornton Wilder watches J.M. Coatzee shake hands with an unseen guest, and Ray Bradbury looks up from the floor. Meanwhile, Robert Louis Stevenson and Saul Bellow make their way to the gym on the basement level while Virginia Woolf and Willa Cather trade a few quiet words, Gabriel Garcia Marquez talks on the house phone, and Samuel Beckett studies something through a magnifying glass. Let’s start at the back of the room on the left. 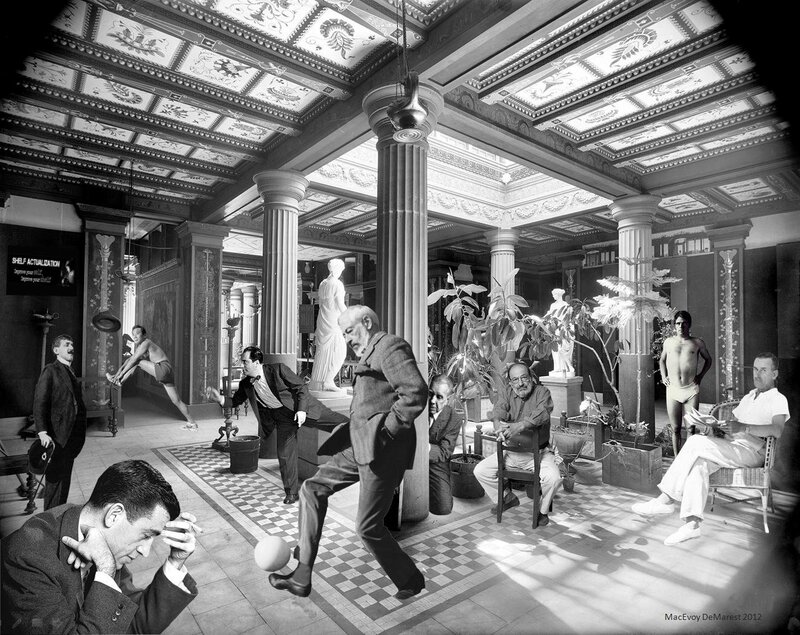 Dostoevsky, in his long coat, and Nabokov, in short-pants and knee socks, gather around the far table with a white-suited Mark Twain, a shirtless, shouting Hemingway and Englishman George Orwell. James Joyce sticks his head through the doorway to see what’s going on, and Wallace Stegner looks on in amusement. Reading the paper at the back of the near table is William Faulkner. Perched at the front of it is Aldous Huxley. Cormack McCarthy, Edgar Allen Poe and Franz Kafka huddle behind a seated John Cheever, who pets an unseen canine companion. Standing at the far right is John Steinbeck, and in front of him rests Joseph Conrad. 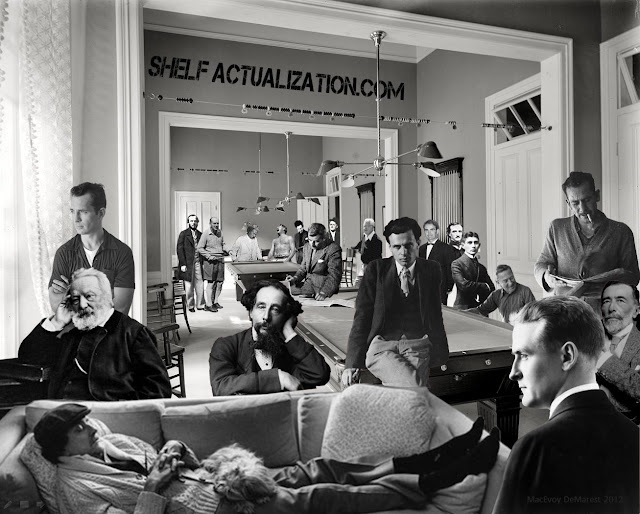 Scott Fitzgerald turns halfway around to face the camera while Charles Dickens and Victor Hugo watch over a napping Kurt Vonnegut. Gazing out the window to the left is Jack Kerouac. 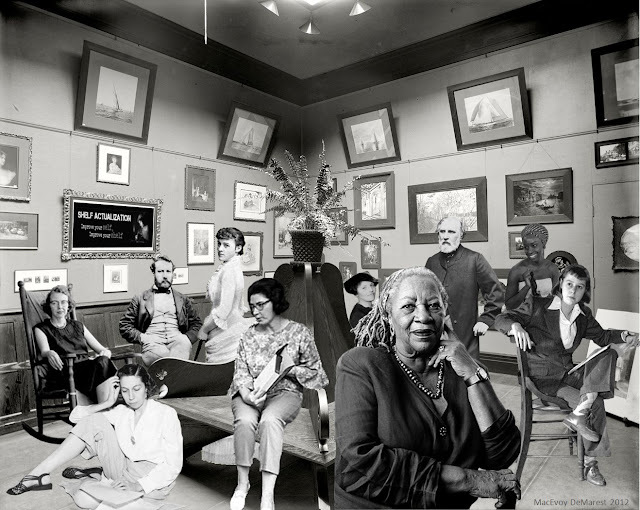 Here, ladies’ men Jules Verne (seated) and Ivan Turgenev (standing) vie for the attention of (from left to right) Flannery O’Connor, Eudora Welty, Edith Wharton, Harper Lee, Pearl Buck, Toni Morrison, Chimamanda Ngozi Adichie and Carson McCullers. At the table on the left John Dos Passos entertains Alice Munro and Ayn Rand. On the right, Salman Rushdie, Ralph Ellison and Italo Calvino shoot the breeze. Over Ellison’s shoulder, Leo Tolstoy and Gertrude Stain catch up on the latest gossip. And Alexandre Dumas waits at the table to the left while Don Delillo stands in the background. High overhead, Herman Melville, David Foster Wallace and Jonathan Franzen look down from upper floor windows. Because it leads out to the gardens and the indoor swimming pool, the Conservatory is often a place you’ll see people start to let their hair down a bit. As he stretches for a run, Haruki Murakami watches William Saroyan toss a hat onto Marcel Proust’s head. J.P. Donleavy tries to interest J.D. Salinger in a game of soccer, while Jorge Luis Borges, lost in his own world, makes a crayon rubbing of the stone pillar behind Donleavy. This amuses Umberto Eco, who straddles a chair like the cool customer he is. On the right , Jack London stands ready for his afternoon swim and Thomas Mann looks up from his crossword puzzle. There's lots more to show you, but we'll let them get back to their work for the time being. Until then, you can continue to follow all your favorite writers as we talk about their books, their lives and their writing on the front page.